Spin Palace Sports or Spin Sports for short, is the sports betting brand for the longtime online casino provider, Spin Palace, which was established in 2001. Spin Sports runs on the elegant and fast SBTech betting platform. This means that the user experience is excellent on all devices. Esports fans also find wide esports coverage with added markets available live and in play. Spin Sports does not have specific esports promos, but they provide an account open offer for new customers from most nations that they serve, terms & conditions apply, 18+. Spin Palace Sports runs on the elegant SBTech sports betting platform. This means you get a seamless experience across all devices. Whether you need to bet from your mobile, tablet or PC, your navigation and betting experience will be very similar and highly intuitive. If you wish to test them out before signing up, click ‘Live odds’ first. Esports events are accessed from the left navigation index of all available sports or from your mobile menu. Spin Sports tends to offer a nice mix of betting markets, not simply the match winner market. As we get closer in time the start of an actual event, more markets tend to open up, especially for live betting. You can often Map winner markets. You can find Totals markets with regard to an Over/Under threshold for betting on the number of match Maps played. You can also bet on the over/under Totals for the score within a given Map. 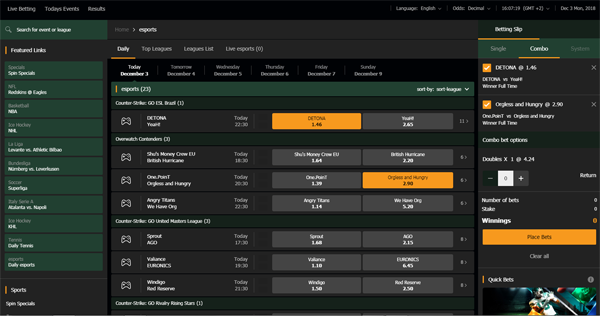 Spin Palace also offers handicap betting, where a team would need to win their match by a certain number of maps, or they might need to win a given Map by a certain number of points. Spin Palace does not tend to offer esports outright winner betting markets for bets on the eventual event champion. If there is a major esports competition that is being played, 10Bet are probably covering it. Games include but are not limited to: CS:GO, League of Legends, Dota 2, Rainbow Six (R6), Overwatch, King of Glory, Starcraft (SC 2), Rocket League, Warcraft, Call of Duty, Artifact and Team Fortress 2. Available banking methods always depend on your location. Spin Sports accepts credit and debit cards, paysafecard, Astropay Card, Neosurf, Skrill, Neteller & EcoPayz and many regionally popular bank debit solutions like iDebit, Instadebit, Citadel Instant Banking, Boleto, EPS, Trustly, Webmoney and many other methods. Spin Palace Sports offers accounts in Euros, US Dollars, British Pounds, Canadian Dollars, Swedish Kronor, Norwegian Kroner, Swiss Francs, Indian Rupees, Brazilian Reais, Polish Zloty, Mexican Pesos, Argentine Pesos and Chilean Pesos. The bottom line: should you sign up with Spin Palace Sports for esports? Spin Sports is an excellent choice for just about anyone when it comes to esports. They offer their platform in many languages, have very good esports league and betting market coverage, a very good betting platform on all devices and highly competitive odds. When new customers click to visit, they will find a new customer offer. Whether you see yourself as an occasional recreational bettor, or a serious and regular player, Spin Sports is a great option. The only areas where they might lag, is the lack of outright winner betting markets for bets on an eventual event champion. If you prefer match betting markets, this is not a drawback at all anyway.